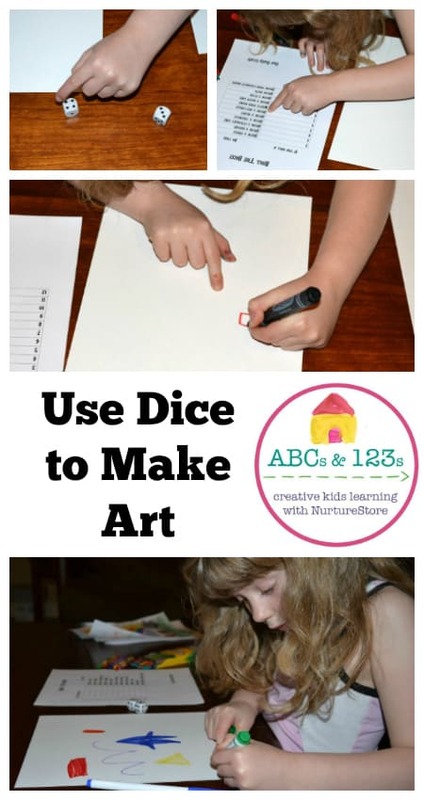 This art dice math game is a great way to build mental math skills with children who love to draw. Please welcome Sarah from Our Daily Craft who joins our ABCs and 123s letter and number series today. Playing with dice is fun for children (as long as they won’t put them in their mouths, of course), and making a dice-rolling game that includes art activities, math, color and shape recognition, or whatever you want to focus on is quick, easy and can be done in a lot of different ways, over and over again. My daughter is six and already knows her numbers and some basic math, so I decided to make her game based on rolling two dice and adding the numbers together. As you can see from the first page of the printable instructions, each number — 2 through 12 — corresponds to an action, such as drawing a straight line, a circle, a square or writing their name. I made another sheet (see the second page of the printable instructions) that uses a single die and each number corresponds to a color, so it’s perfect for using with a coloring sheet if you like. Because I put out a rainbow of colors when I set the activity up, my daughter wanted to do six moves, one for each color. 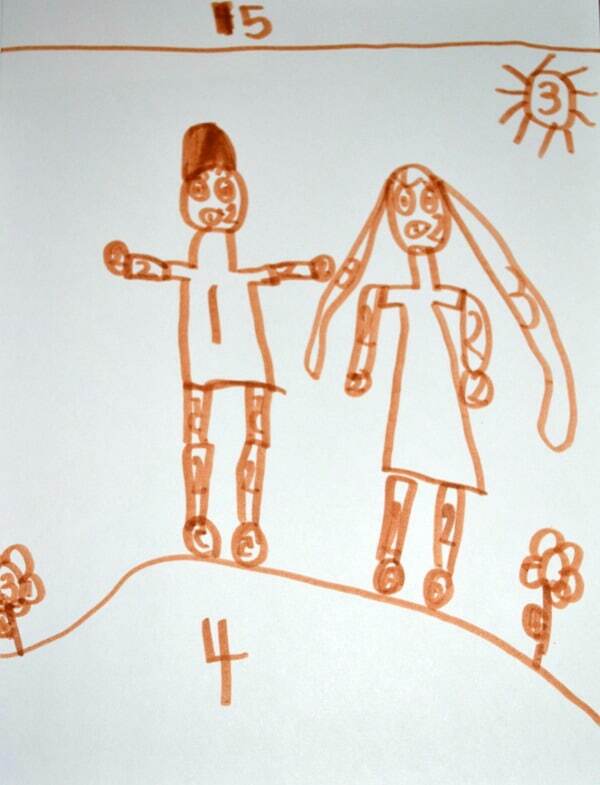 She also drew her own color-by-number sheet to use with the single-die game some other day. I didn’t expect her to do that, but it’s really cute. Depending on the age of your child you can make this game work a lot of different ways. To reinforce learning numbers, use a die with numbers instead of dots, or have your instruction sheet show the number of dots corresponding to the actual number. To learn shapes, you could have cutouts of simple shapes and have each number correspond to a shape they could use in a collage. 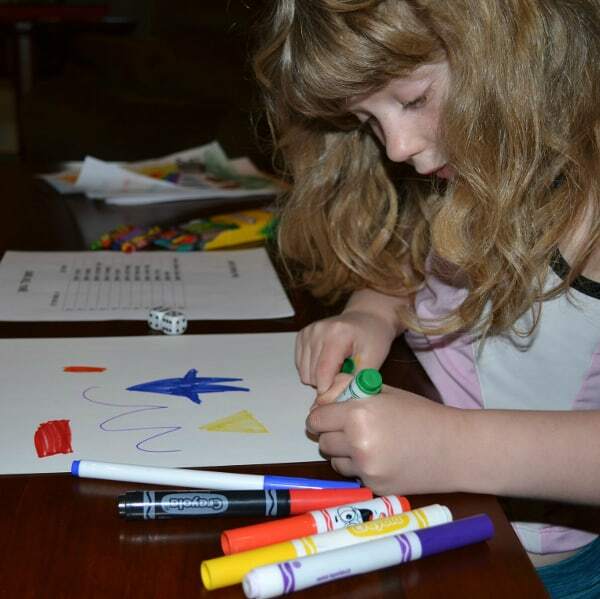 You could also use multiple dice and have each one correspond to a different thing, such as color, shape and number, so a roll of 3, 4, 6, for example might have your child drawing 6 purple triangles. Or use dice with different numbers of sides. Reinforce counting by having the child collect their number of items of the same shape or color from around the house. Make it about action instead of art and have each number correspond to a movement like running, jumping, skipping rope, etc. Take it outside (especially if you have large yard dice) and play the action version or color with sidewalk chalk. If you have plastic Easter eggs, it’s easy to set up this sound game for and with your kids. Need a bunch of ideas for sick days, snowy or rainy days, or just days you don’t have anything going on? Check out my lists of 64 things to do with a toddler and 40 activities to do with a preschooler. Sarah E. White is a crafter, writer and mom based in Arkansas. She writes about knitting for About.com and CraftGossip.com, and about crafting with and for kids, creativity for moms and other busy people, and creating the life you’ve always wanted at Our Daily Craft. Sign up for her newsletter for weekly updates on her daily creative challenge, kid’s craft ideas and more.